Tuning surface energy at the nanometer scale: A new step towards controlling neuronal differentiation? In this paper, we study the impact of the spatial distribution of surface energy on the ability of PC12 cells to extend neurites, which are projections from the cell body characteristic of differentiating neurons. PC12 cells are a well-known model for studying the mechanisms of neuronal differentiation that is typically induced by a treatment with a soluble factor, the “nerve growth factor” (NGF). In recent papers, we showed that PC12 differentiation could be triggered through cell-surface interactions only, providing cell culture substrates displayed nanoscale heterogeneities. Here, we use patterned surfaces to finely tune the magnitude of the surface energy gradients and total surface energy and compare their respective propensity to trigger PC12 neurite outgrowth. Glass surfaces were crafted with nanometer-sized gold pillars as culture substrates. 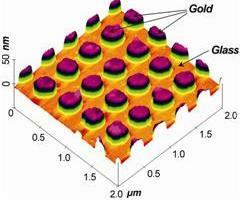 Our data indicate that PC12 cells are sensitive to the respective amounts of gold and glass, and show a better ability to differentiate on surfaces containing the highest proportion of gold. Precise thresholds regarding the spatial range and the magnitude of the surface energy gradients critical to the cell response could not be assigned here. However, our results pave the way for new experiments where surface functionalization combined to the surface patterning strategies used here should allow us to quantify parameters that, once known, would be of great value to the design of biomaterials for tissue engineering applications.